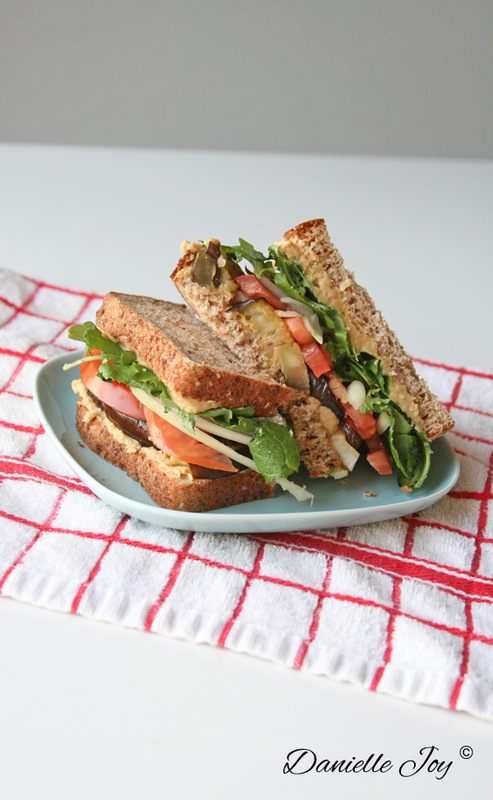 Eggplant Sandwich - Your process has a purpose. In a small bowl, stir together about 2 tablespoons of olive oil, paprika, garlic powder, oregano, salt and pepper. Brush each side of the eggplant slices. Heat a skillet and cook each eggplant slice for 3-4 minutes per side. Spread hummus onto both slices of bread. Top one slice with eggplant, another layer of hummus, tomato, onion, and lettuce. Top with second slice of bread. Cut in half & savor!